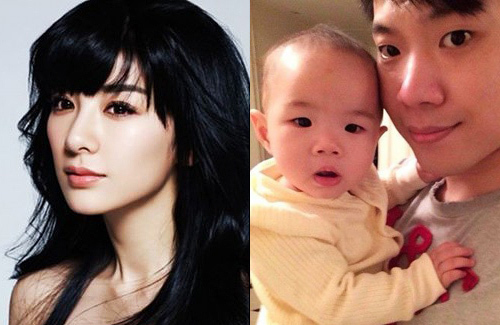 Following a nasty publicized argument last year, it was rumored that mainland Chinese actress Crystal Huang (黃奕) and her husband, businessman Huang Yiqing (黃毅清), were headed for divorce. Though the two eventually reconciled, their relationship appears to have remained rocky. Recently, Yiqing issued a final warning to Crystal after she was spotted secretly meeting with another man. In November of last year, Yiqing publicly criticized Crystal on his Sina Weibo, accusing her of being mentally unstable and hinting that he wanted a divorce. He also uploaded a video of the two arguing, during which Crystal allegedly dropped their daughter, who was 11 months old at the time, on the floor. Yiqing also took offense at a news article about Crystal’s secret meeting. The article in question mentioned his previous Weibo attack, as well as his subsequent apology and change of heart, and stated that Yiqing was criticized by netizens for his constantly changing moods. However, in his point of view, the reporter was simply trying to muddle the article’s focal point, which was about Crystal’s infidelity, by bringing in unrelated news. Once unfaithful, always unreliable…dump her…make it easy on yourself and the child. The child needs you now more than ever during her growing years. poor daughter, her mom doesn’t cherish her. she’s so cute. You should not say that because if she did not,then she would have given her up. It feels like her husband is using their daughter to make him sound like a goid father while tarnishing her reputation as both a mother and wife. The last time I heard that he said he only married her because she was pregnant. If that was the case,then that does not sound good and I have seen many shot gun weddings not last or end up well. Last time I can give Crystal Huang benefit of doubt but she did it again. She cursed her husband on weibo as much as he did to her, hence he is not the only one who is tarnishing the reputation of the other. The arguement between her and her husband makes both look like liars. Really,what did she say? Thus is sad that husband and wife have to attack each other like that. I have a feeling they may be headed for divorce and if so,I feel bad for their daughter. Regarding her husband, she implied that the baddie will be punished by heaven, calling him evil. She also hinted that her husband was the one who spreaded bad news about her to reporters. She said like she is the victim of domestic violence and she kept calm because of her daughter (which is much the same to what her husband said). As for the man she dated, she said they went to a hotel to talk about work. However I think it is hard to believe that a man and a woman can talk about work in a hotel that late at night. I looked through the links and did not see any photos so you wonder if this is even true at all? I guess we should all remember what her husband did last time when they are argued. You really wonder if we can all trust his words this time? The next thing you know,he can be out to tarnish her image and reputation. Don’ t you all notice that Huang Yi has not really said anything while it is her husband that often does all the talking? You really wonder about that and his mood swings too. I guess as outsiders we truly do not know what happened but it feels like their marriage is on the rocks. Agreed, sounds more like a publicity stunt for her 2014 films. Crystal Huang’s meeting with the rich businessman made bigger headlines in Mainland media today. You can view the embedded video (newly added) for a photo of her meeting with the man at a hotel. Her husband, Huang Yiqing, seems to have a terrible temper and is so ready to humiliate her publicly. When Yiqing reacts in this way, issuing his final warning, it only reinforces public’s perception that she had indeed cheated in their marriage. If there were photos of the 3rd party in that video, I missed it. The frame at 0:25 seconds shows the man’s face. The man in black on the left side (@ 0:25 sec)? That’s proof? I know many people have business meetings at restaurants in hotels. Actually, it’s very common for people (especially those who can afford it) to dine in restaurants in hotels. Thanks for the info,but just because she meets with a man does not mean that she is cheating on him. I used to have a close friend who at times with would alone with his female friends who are married. It really depends on the situation is as well. I have feeling her husband is nit only bad tempered but is a bit possessive and probably gets easily jealous as well. If he did not trust her then he should not have married her even if she was pregnant. The husband may know of other contact between Crystal and the man if he is reacting in such a manner. I don’t agree with his handling of the situation because he speaks in a completely disrespectful manner, which reflects the type of person he is. However, I reserve judgement on Crystal’s relationship with the man, except that her husband’s reaction reinforces any public perception towards the meeting with the man. Ok,I just tried to view the video,but cannot see anything and can only hear what was already said in the article plus a few more details. Hm.. I wonder if her husband regrets husband actions and requested for the video to be taken down? I agree and we really do not know what Crystal’s relationship is with this other man. But the way her husband is reacting does not put him in a good light. I feel they have a lack of communication which is one of the major factors they can break up any marriage/relationship or even friendship. It really seems like he is out to tarnish her reputation since she is a celeb while trying to gain public sympathy and playing the victim. Crystal Huang went out to deny and she did not forget to curse her husband. In reply, her husband also bashed her. I saw the pictures of Crystal Huang to an hotel with a man on a tabloid. She entered a hotel with that man at night and stayed in his car as well. In 2 days. If she did,then she is suffering the consequences now. This is really sad. I also find it strange foir him to say that he remains silent but yet he appears to be the one always doing the talking. Very strange. A dude ranting his family problems on weibo and pouring an outcry to the public does not seem like a man to me at all. More like a sissy who cannot fix his own family problems. He wants to public see him as this devoting father dealing with his wife cheating. Yet, the problem might be himself afterall. Ok, you can stop looking at the mirror now. It sounds like the guy is trying to gain public sympathy which makes it easier for divorce; custody battles and alimony. Yes, I think that is what he is doing too. Feel bad for Huang Yi if she truly is not cheating but has to endure all this. Honestly,even if she did cheat,for her husband to air the dirty laundry out in public is not good either. They are the same. And if in few days time, they will love, happy, etc. like last time, I will say that they are acting to get spotlight. What a lowlife. Trying to play the sympathy card. Airing her dirty laundry to the public is a douche bag move. Making himself out to be the angel. What a tool. This is not a real man. I read bazi, and I don’t see any cheating in her chart. I would love to get the husband’s bday!